The street name clearly shows where this was taken, on the corner where Sclater St meets Brick Lane. The plaque on the wall above and to the left of the modern street sign states "This is Sclater St 1798". 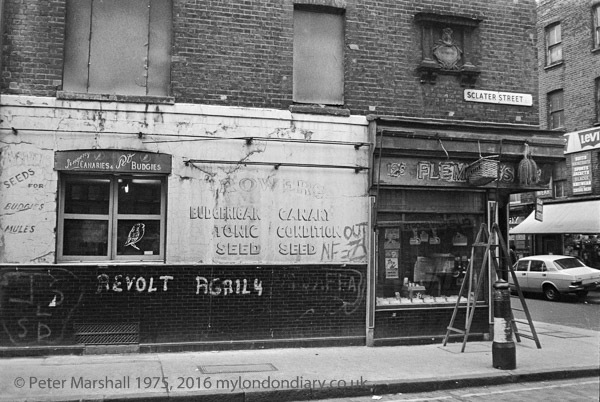 Sclater Street had long been famous for having a bird market every Sunday, but during the rest of the week there were just a few shops, such as this, still operating. Trowers with its 'Singing Canaries & Pet Budgies' had a different name on the shop front, part obscured by a basket. It is now a shop selling women's fashion. It wasn't just birds that were sold here, at least in earlier days, but a wide range of wild animals. The whole area - which crossed over the Bethnal Green Road into a street called Club Row - was known as Club Row Market and back in the 1950s you could buy puppies, cats, snakes, gerbils, monkeys and more - even the occasional lion cub. Pressure by animals rights groups and bodies such as the RSPCA eventually led to the end of live animal sales, finally banned on the streets by Tower Hamlets Council in 1983. The house has been done up a bit since, the signage removed and a new door added with the window shuttered, while the first floor now has windows and curtains and appears occupied, and, like most surfaces around Brick Lane is now covered with graffiti. Back then there was relatively little graffiti, and the word 'REVOLT' really stood out, though the second word, which appears to be AGAIL4 is incomprehensible to me. Further to the right is a reminder that this area was close to Bethnal Green Road where the National Front used to come to sell their racist news sheets - and were sometimes involved in scuffles with anti-racists.